I've been using MDP and matplotlib a lot recently and although overall I've been very pleased with the documentation for both projects I have run into a few problems for which the solutions were not immediately obvious. This post gives the solution for each in the expectation it will certainly be useful to me in the future and the hope that it may also be useful to others. The tutorial for the Modular Toolkit for Data Processing (MDP) starts with a quick example of using the toolkit for a pca analysis and yet I still ran into a couple of problems. 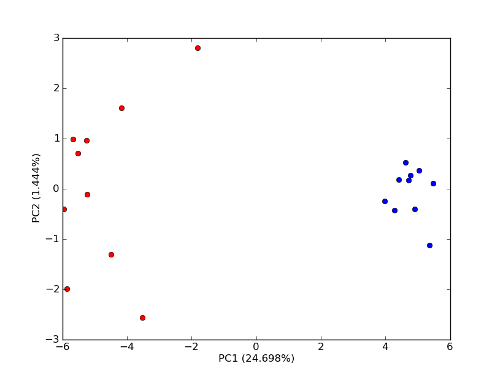 The first issue I had was how the pca function expects to receive data. I suspect this is simply due to unfamiliarity with the field and the language used within the field. For future reference the data is expected to be in the following format. Experimental Condition 1 . . . . Experimental Condition 2 . . . . The previously mentioned quick start tutorial was very useful in getting something useful out quickly but I couldn't find a way to get a value for how much of the variance present in the data was accounted for in the principal components. To get that, as far as I've been able to determine, you need to interact with the PCANode directly rather than using the convenience function. The code is still relative straightforward. Running this code produces an image similar to the one below. The growing neural gas implementation was another sample application highlighted in the tutorial for MDP. It held my interest for a while as a technique which could potentially be applied to the transcription of plaques for the openplaques project. It wasn't immediately obvious how to get the position of a node from a connected nodes object. As the tutorial left the details of visualisation up to the user I'll present the solution to getting the node location in the form of the necessary code to visualise the node training. The end result will look something like the following. 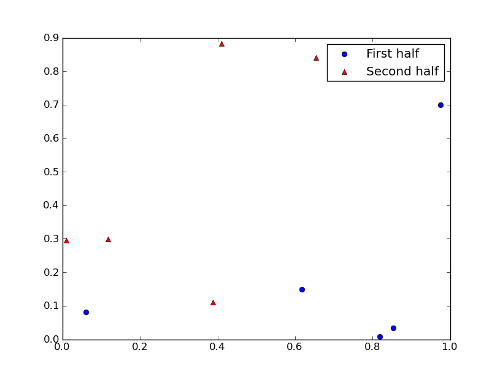 I've been using Matplotlib to plot data exclusively for a while now. The defaults produce reasonable quality graphs and any differences in opinion can be quickly fixed either by altering options in matplotlib or, as the graphs can be saved in svg format, in a vector image manipulation program such as Inkscape. 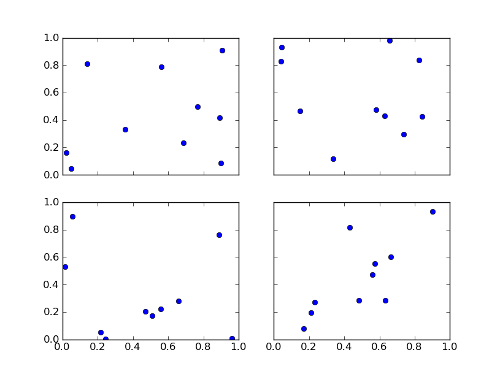 Although most options can be changed in matplotlib it can sometimes be difficult to find the correct option. Most of the time the naming of variables are, to my mind, logical but sometimes I just can't find the right way to describe what I want to do. I wanted to have a grid of 6 graphs but didn't want to display the axes on all the graphs as I felt this looked cluttered. If I was going to display the axes on only some of the graphs then the values for the axes needed to be the same on all of them. Running this code should produce an image similar to the one below. The legend assumes that values are connected so two points and the connecting line are shown by default. If the points on the graph aren't connected then this looked strange. To remove the duplicate symbol is straightforward.